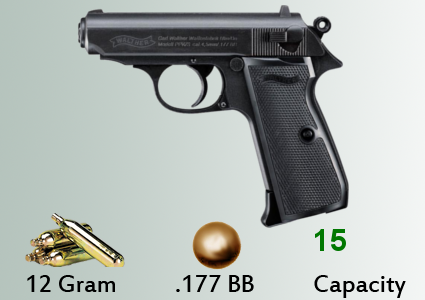 The Walther PPK - made legendry by it's use in James Bond movies beautifuly replicated into a CO2 pistol with metal slide & blowback action to provide realism. One of the most popular WALTHER pistols in the Umarex range has been improved: The Walther PPK/S with a metal slide now has a new piercing mechanism for the CO2 cartridge – it’s invisible when the gun is seen in profile. The required Allen key is part of the grip plate and is therefore always at hand. The heavy slide generates a noticeable blowback effect. Upgraded in 2016, this version of the popular Walther PPK/S CO2 pistol is more realistic, thanks to the 'tucked away' CO2 loading port. Our CO2 guns are available to purchase for collection in store only - Once you place your order, you will receive an order confirmation - you also need to await a secondary email confirming availability. ID is required upon collection. A pack of three, fifteen shot magazines for Umarex Walther PPK CO2 pistols.